This week while Anu and kids were away in Surat, I got some time to visit my old love. Obviously I am talking about Classical and Sufi renditions and other Urdu and Punjabi ( more Sufiyana ) poetry which is sublime and sensuous to your soul. Its like Spa to destress the soul and soothe it. This led me to various new blogs which have cropped up. Couple of them very neatly presented and arranged. One feels happy that the new generation is still interested and in some way connected. How long will it continue who knows ? Anyway for this post, I want to concentrate on one person who has left an indelible imprint on me - Amrita Pritam ( and her connection with Waris Shah). 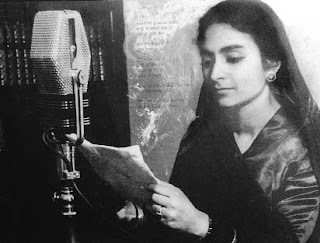 Amrita Pritam - What a towering name in Punjabi Literature on both sides ( India and Pakistan ). This beautiful face changed the face of Punjabi literature with her revolutionary thinking and writings. She defied the traditional image of women. The fertile soil of the land of five rivers provided the richness to her genious mind to bloom. Born in undivided Punjab, the carnage partition brought about left her devastated. Its during these days, she wrote - Ajj Aakhaan Waris Shah Nu ( Ode to Waris Shah ), arguably her most famous piece. So heart rending is this masterpiece, that it will leave you speechless and tears will flow naturally. I am producing couple of lines below ( since I am using google hindi converter, some words may appear distorted - please see the essence). I call out to Waris Shah today, to speak out from the grave. And open another leaf from the book of love. When one daughter of Punjab had wept, you wrote a million dirges. Today a million daughters are weeping and they are looking up to you, Waris Shah, for solace. That her pen captured the depth of pain so effectively, tell us that she fathomed the depth of trauma herself and had felt the sorrow of fellow citizens. Many singers have lent their voice to this masterpiece. I have heard the one from Wadali Brothers - the one they sung for the celluloid version - its supremely beautiful. Even I have recorded one in my voice and I feel proud of that. She was at her best in 'Pinjar' ( Skeleton ). A novel, later a film ( by Chandra Prakash Dwivedi ) , of Pooro ( a Hindu Girl - enacted by Urmila Matondkar in film ) and Rashid ( A Muslim Boy - enacted by Manoj Bajpai ). Its about sufferings, the girl Pooro, goes thru due to her abduction, shunned by her own parents, and then the partition, which takes her to the other side. Rashid who gets caught in this, due to acts of his chauvinistic parents, later, together with Pooro, helps out in saving other Hindu girls from Muslim abductors. Post this, she accepts Rashid, for so long her body which was skeletal, gets flesh. A must read novel and must see film. Its thru these works that one can feel the trauma, lacs of people went thru during partition. She wrote more than 100 pieces ( together with Novel, poems etc. ). Padma Shree, Padma Vibhushan, Jnanpith Award, Sahitya Academy Award etc. came along as she travelled her literary journey. Just capturing the high points of her biography, as this space is insufficient to talk about this queen of Punjabi Literature. The literary giant left for heavenly abode on 31st Oct 2005. A casual search on the net, shows glowing tributes and obituaries, from all over the world, every media, which confirms that she belonged to the world and not just India. I pay my respects to her with my rendition her 'Aaj Aakhan Waris Shah Nu'.